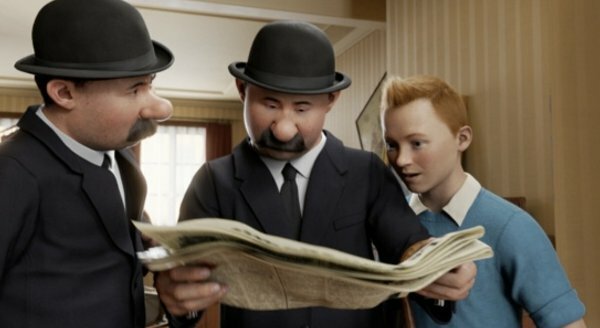 The Adventures of Tintin | Three Cheers for Darkened Years! This is the first animated film Stephen Spielberg has made, and it kind of shows. Let me explain what I mean by that. A live-action film director, even in the age of CGI, still has the limitations of reality. They must world with real actors, a real camera, and real props and sets. Cameras cannot, after all, be placed just anywhere. And while most creative directors use their technical limitations to grow aesthetically (art can’t exist without restraint, etc. etc. etc. ), I imagine there are some who feel a bit stymied by the low level of technology available. Spielberg, then, by making an animated film, has granted himself the freedom to essentially put the camera wherever he wants, as there is, after all, no camera to speak of. The result is a non-stop, completely frenetic adventure film that breathlessly rushes from one spinning, speeding action set piece to the next with little time for exposition or even a brief rest. The “camera” never stops moving in this film; every single shot is a slow pan, a quick tracking shot, or an impossibly long zoom. This means that you will indeed be dazzled by the bright images and creative pulp conceits in the film, and you may even find yourself charmed by the boyish reporter Tintin, and his shallow-yet-intrepid need to solve a mystery. If you were like me, however, you’ll find the charm quickly worn down by a surfeit of action, swirling camera movements, and complicated plot machinations that speed by far too quickly to absorb in any sort of meaningful way; you won’t be lost, but you won’t much care (there is a scene wherein characters give vital lines of exposition during an action sequence). Spielberg is a master of a certain kind of adventure film (look at the chintzy fun of his “War Horse,” for instance), but when allowed to work unfettered in a completely CGI-animated environment, he seems to have stepped over a few important aesthetic lines. As a filmmaking experiment, “The Adventures of Tintin” is fascinating to look at, and may even be pretty entertaining for some people. As a film, though, it feels like it didn’t get the attention the material demanded. Had it been a 20-minute short film, perhaps it would have been perfect. The characters are, I should also mention, achieved through CGI motion capture. This means the usual thing that motion capture has implied in the past: that certain shots will be appealingly real, some will be uncannily strange, the caricatured facial design can come across as weird (realistic skin, but an oversized nose), and the eyes are a little dead. Motion capture can occasionally work to great effect, but in its history, it has only worked well a few times. I admire the armies of computer technicians and expressive motion capture actors that are continuing to try something new. The story is taken from a few of the books by world-famous cartoonist Hergé, whose work has sold millions in Europe, though he is something of a cult figure here in the U.S. The story follows Tintin (voice and movements of Jamie Bell) and his intelligent dog Snowy, already well-established adventurers, going after a hidden treasure as indicated by a secret map hidden inside a model ship. Also after the treasure is the evil Mr. Sakharine (voice and movements of Daniel Craig) who has more information on the matter. We also eventually meet the perpetually intoxicated comic relief sidekick Capt. 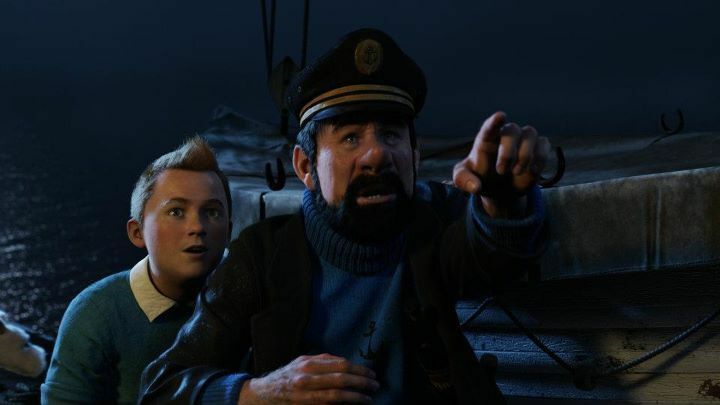 Haddock (voice and movements of Andy Serkis) who, somewhere in his booze-damaged brain, holds the secret to the treasure’s final resting place. The various action-packed dealing between these three make for some spectacular chases and flashbacks, including an unedited take wherein the trio chase each other through the streets of a Moroccan Kasbah, firing guns and grabbing desperately at an eagle that holds a treasure map. Tintin is a Dickensian cipher at best. He has little to offer the story, and it’s only his bland sort of heroism that keeps the tale moving forward. As the film progresses, focus shifts to comic relief Capt. 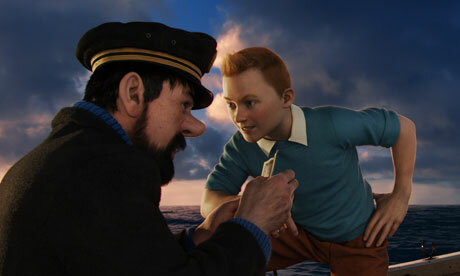 Haddock, and the film begins to drown in his CGI mugging and drunken tirades. It’s not insufferable, mind you, but it does occasionally come close. “The Adventures of Tintin” was written by “Doctor Who” guru Stephen Moffat, cult film hero Edgar Wright, and the director of “Attack the Block,” Joe Cornish. The second unit was directed by Peter Jackson. That such a dream team of geek icons would come together for any project probably had some audiences built in. But perhaps there were too many over-enthused hands in this one. 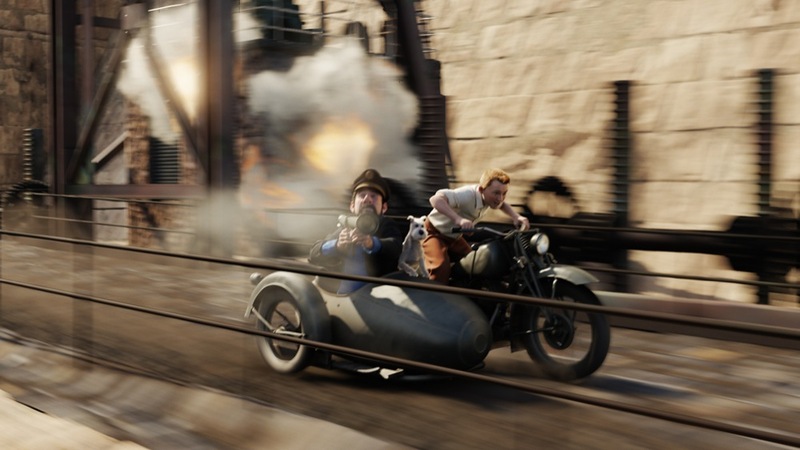 “The Adventures of Tintin” is a wild ride that frays itself to the quick. You may be charmed for a span, but you’ll leave kind of exhausted.